A piece of public art in a provocative place. The angle may be confusing, but the idea is to tease those who consider themselves fervent cityscape lovers and who may have recently walked the Southwest turf by the sea. Look around and you may stumble upon a sculpture of familiar proportions - so much of Washington seems built on pyramid schemes - literal and figurative, the hierarchical mode being a common pattern. Rankings are rife, to say the least. This probably wasn't Byron Peck's idea when he produced the colorful tile piece in 2011. 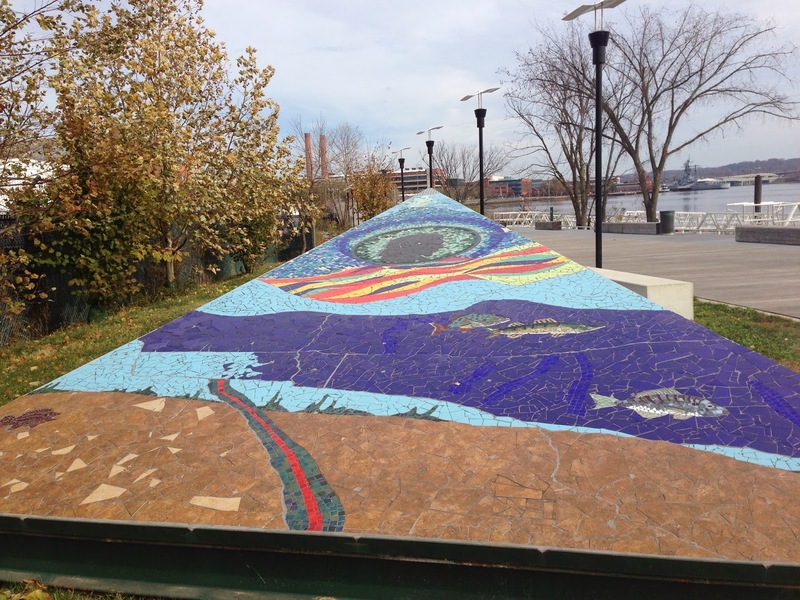 A plaque says it is to honor 'Diamond Teague and the other Earth Conservation Corps volunteers who devote their lives to the restoration of the Anacostia River."